This documentation covers the in-development release of Review Board. You can see the latest stable docs or all previous versions. Updating review requests is very much like creating review requests. Once you have a review request out there, you can upload a new diff, add new file attachments, or modify the fields. Any changes you make will be seen by you only until you publish the changes. Most fields on a review request can be changed, with the exception of Commit and Repository. To change a field, either click on the field (in the case of Description and Testing Done) or click on the pencil icon. A text box will appear allowing you to modify the value. To save a field, press the Enter key or click OK. To revert your changes, press the Escape key or click Cancel. The Owner field represents the current owner of the review request. This is the person responsible for updating the review request and responding to review feedback. If the original owner is no longer responsible for the change (for instance, they’ve left the team or the company), they (or an administrator) can re-assign the review request to another user by editing this field and choosing the new owner. Changed in version 3.0: Prior to Review Board 3.0, this field was called “Submitter” and was not editable. The Summary field is a short, one-line description of the change. It’s what people will see in their dashboard and in e-mail subject headers. You should aim to keep this short and as descriptive as possible. The Description field describes the change that will be reviewed. This is intended to provide enough information for reviewers to know what the change is about before they go to review it. This field supports rich text using the Markdown language. See Using Markdown for more information. The Testing Done field describes how this change has been tested. This should cover any and all testing scenarios that have been done, in order to help reviewers feel more confident about the stability and design of the change. The Branch field describes which branch your change applies to. This is a very free-form field and can contain any text. In the latter case, this could be used to show the series of branches that the change would be merged down to, starting at the branch where the change originated. The Bugs field is a comma-separated list of bug IDs that the change addresses. 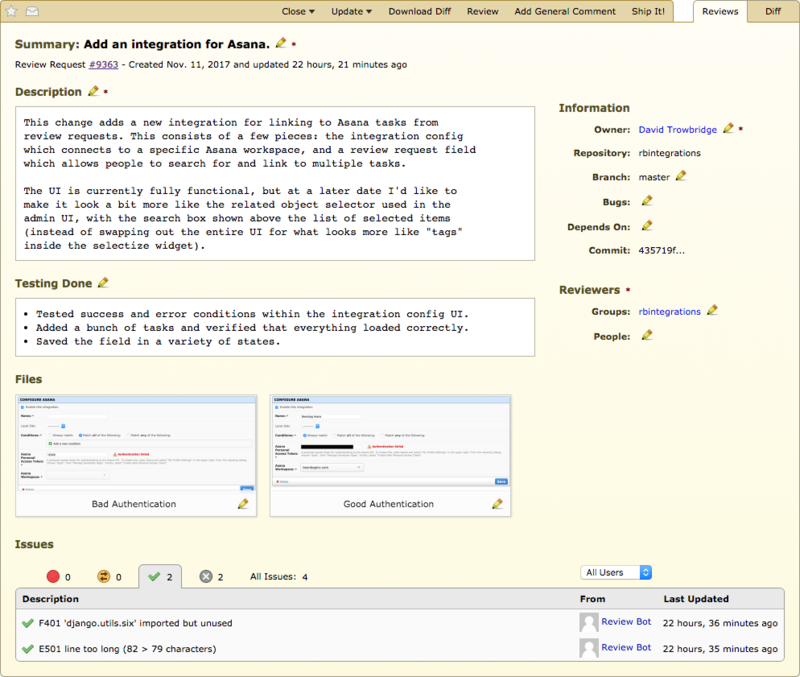 If the repository is configured with a bug tracker, the bug IDs will link to the reports on the bug tracker. The Depends On field is a comma-separated list of review request IDs which are used to indicate dependencies between changes. The IDs will link to the other review requests, allowing reviewers to take that information into account when reading the changes. The Groups field is a comma-separated list of all review groups that should review the change. When entering a group, Review Board will attempt to auto-complete the group. It will match against either the group’s ID, or the group’s name. While auto-completing, a drop-down of possible groups will be displayed, showing both the ID and name. Review Board doesn’t enforce that the groups must review the change before it can be submitted. This is a policy that is left up to each organization. The People field is a comma-separated list of all the people that should review the change. When entering a person, Review Board will attempt to auto-complete the person’s information. It will match against either the person’s username, or the person’s first or last name. While auto-completing, a drop-down of possible people will be displayed, showing both the username and full name. Review Board doesn’t enforce that the people listed must review the change before it can be submitted. This is a policy that is left up to each organization. The default set of fields may not be enough for some organizations, or some of those fields may not be wanted. By writing an extension, the list of fields on a review request can be changed. See Adding Review Request Fields for details on how to extend the list of fields on a review request.